Just recently - as you may know, I've added FileReference support into OpenFL-bitfive some time ago, which means that one can now use file dialogs to exchange files with user in HTML5 applications. Provided that I wanted to verify that new features work as intended in most cases, it was a logical choice to actually make something to use it. So I've settled with a project that requires a bit of file operations, a bit of cryptography (Terraria profiles are AES-encrypted), and some UI elements as well. So a week of morning work later, there goes this. Well... because, I can. Also, should you look at existing profile viewers/editors for Terraria, most of them are written in C#, do not have that much of a comfortable UI, and are generally not particularly up to par. So I've decided to make something that would be a change - look good, stay functional, and work everywhere. One of things I find particularly annoying in tools of this kind is the dependency on other tools or documentation - even if there's a built-in item search function, you still cannot efficiently compare items without looking at wiki (which can be outdated) or loading up the game (which takes time). At the same time, Terraria (application itself) features an external interface, which can be used by applications for multiple purposes. So I've made a small separate C# tool that would poll the game for item information and then write down significant parts for later use in Haxe app. And, of course, there's the usual functionality of adding/removing items, tweaking prefixes, changing player names & modes, and whatnot. Everything is kept more or less intuitive and matches style of game fairly well. Thank you for this tool, it rocks! So, I’m making a new character, right? I can only see the one I made IN the folder, but booting up terraria, it doesn’t recognize the character even being there. Would it be possible for you to take the terrasavr experience to Xbox and PS? Not impossible, but would be far less straightforward for the user, and wouldn’t be too legal either (FAQ), so I don’t think I’ll be trying my luck. 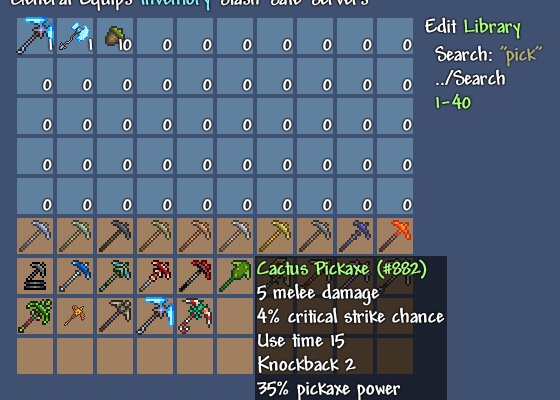 Hello, is there a way to update your tool so that it can show modded items (if only by Item ID, qty, modifiers, and maybe an item icon denoting that it’s from a mod)? That way modded items will not get overwritten when editing the save file, and they can be moved around and manipulated. Really useful tool for building servers, though. Thanks much for creating it. It is only if items are stored somewhere else entirely that they cannot be shown; Terrasavr tries to not break things by writing any extra data from the file the same way it was read. That’s also where the trouble comes, as there’s no universally agreed upon way of doing this so it varies mod to mod – some use normal IDs slighlty outside of game’s ID space, some write them to the end of the file, some write them to an entirely different file. Not sure how one would support this without enduring the task of writing (and maintaining) a few decades of different format handlers. Hopefully ReLogic will do some form of official modding API sometime. There’s a search bar where categories are, example. How do I transfer my character onto the console version if i can? You can’t – mobile and console versions use a different format for save files, and there are other factors (FAQ). oh. Do you have anything or know anything for console? I’m not aware of there being any specific tools for that, but I also don’t play Terraria on console so I’m not a reliable source of information on this, unfortunately. Try the flash version. If you have large screen resolution/density but a small amount of RAM, can also try running the program in a separate smaller window. I am having problem that I have green dots in terrasavr inventory. That would mean items that are either not something present in the base game (e.g. mod-made items), or not something known to Terrasavr (e.g. ReLogic sometimes add a few items together with fixes into updates). There’s no harm in these and you can still manipulate them as usual (aside of not seeing name/icon). Thanks, alot I did not know you still had Terrasavr support. Will there be any update fix for green dots in terrasavr. If it’s some Terraria items, then yes – when I’ll be updating the program for the next large[-ish] update of the game. If it’s about modded items, then no (see FAQ). Generally I just update Terrasavr to work with new non-minor releases of Terraria because there’s a lot of other work to do. Will probably try making a new editor when OtherWorld comes out, but I guess that’s not super soon. hey Actually the link doesn’t work on PC’s explorer but on the mobile’s.How about adding the function of changing the value ”Use time”?That can be useful.Is that possible? The game stores most of the things as 4-byte integers so values are in -2147483648..2147483647 range. This is not something that can be bypassed without having mods that change the save format, again (e.g. TAPI allowed higher values but it’s kind of dead now). It is not possible because the save files only store item ID (numeric), item prefix, and item quantity. Item stats are determined by the game itself. You’ll need some actual patch/mod for that. Unfortunately I haven’t had time to properly play Terraria since 1.3.0 release (was that mid-2015? ), so I’m not aware of what mods work best/at all with the current version. I made a tiny TerrariaPatcher plugin in 2015 to allow changing use time and a few other stats via INI files, but I’m pretty sure that it doesn’t work anymore (ask on forums, maybe someone can fix it up), and it seems like TerrariaPatcher isn’t updated to the current game version either. In general, modding Terraria is not a pleasant process, as the amount of work required to update the mod grows both based on number of changes it makes, and on number of changes that new game update introduces. You can use some hacks from mpgh. Is there a way to choose like 500 Blocks at the same time? Exactly same as in the game – click and hold to pick more blocks. Or middle-click to stock an item to max capacity. Not possible – the map is stored server-side. The only thing stored client-side is the minimap data, but the file contains nothing more useful than what you can already see on the map view in-game. I would assume that someone might have made a minimap data viewer by now – take a look around the forum. Does terrasavr work on a mac? I’ve tried to use it but my character wont load in the game. Is there something i’m doing wrong? It should, so long as you are using the flash version or a non-outdated version of Safari. Did you take a look at FAQ? I’m using Chrome and I can save and download the character, but it doesn’t show up in the load character screen. However, i will check the FAQ to see if I can fix it. Isn’t the terrasvr working anymore? I now see it no longer works in Firefox v50.0.2 (actually Waterfox). In Internet Explorer v11.576.14393.0 it does work correctly. How do you stack items? Same as in-game – hold to grab more of an item. Or use mouse wheel. Or click on item twice to select the slot and enter the desired number in the right-side section (keep in mind that game won’t let you “overstack” items past limits though). Thanks! I had this problem too much. I have no plans of making any web-based world editor for Terraria since such a project would either be very basic (if it was only to allow changing a few variables, which you don’t need often) or extremely costly to develop and maintain (since it would need to download and precisely replicate drawing of most of in-game graphics). Hey, I just wanted to ask for some help, I’m still not sure how to use this program and I’d really like to use it. But unfortunately, It doesn’t load the items and dyes I’ve put into my backpack via Terrasavr. Nor does it display the other saves I have when it displays the single save it does display. Thanks for the help! Nevermind I figured it out thanks again! How did you figure it out? !